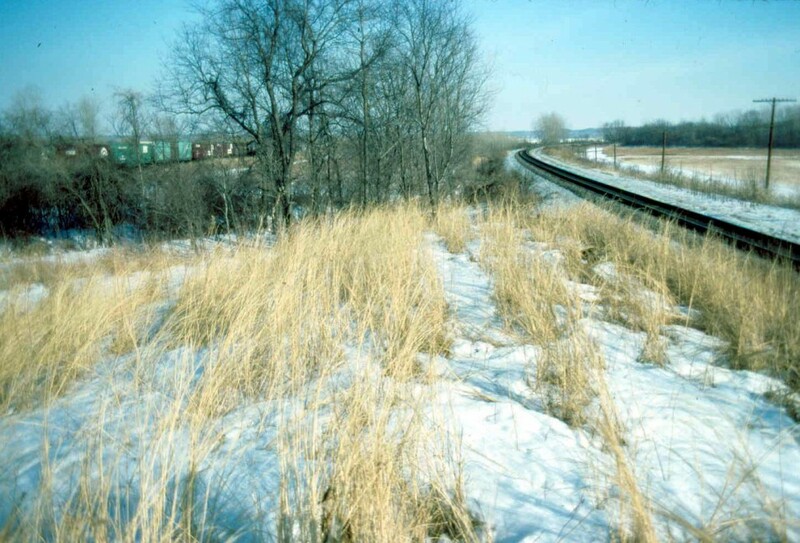 Sometimes known as True Rattlesnake Mound, Mound 64 is located between the railroad tracks directly south of Mounds 61 and 62. Patrick shows it as a rectangular mound with the long axis directly east-west. An 1892 photograph in the files of the Missouri Historical Society illustrates what may be this mound. It is labeled “Hayrick Mound of the Cahokia Group, Madison County, Illinois, 1892. One mile south of Cahokia Mound size 250 feet long, 12 feet wide, 50 feet [?] high.” No railroad tracks are visible in the photograph, so the mound may actually be Mound 66, but the dimensions given on the photograph are too short to be Mound 66 and the height too great. The early maps recording this mound show it much lower. The McAdams Map of 1882 gives a height of 15 feet (4.6 meters) and the Peterson McAdams Map of 1906 only 8 feet (2.4 meters). It is difficult to know which of these is correct; for example, the dimension of 12 feet wide given on the Missouri Historical Society photo is not consistent with a mound 250 feet long and 50 feet high. Probably the width and height are reversed on the photo label. The 1966 UWM Map, which can show only portions of this mound since it is buried under the railroad tracks, suggests an east-west dimension of 73 meters (239.5 feet) and a north-south dimension of 27 meters (88.6 feet).